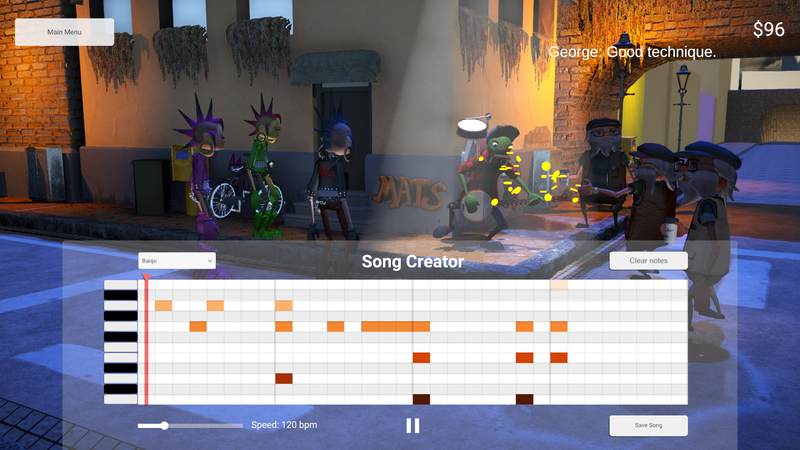 Compose your own music and perform it in front of strangers on the street! Adhere to the feedback from your listeners and bewitch them with your catchy beats and melodies! This is a prototype that was developed during the course of about two weeks. It does not convey the experience of a full game and its main purpose is to test the core concept. I really dig the concept! It reminds me of the old Punk-o-Matic flash games which I loved! It runs a little slow on my computer, but I'm sure that could definitely get worked on! I really like how the audience interacts based on what type of music is performed, and I found that song that makes everyone happy is Mary had a little lamb with a bit of banjo metal over the top. The UI could definitely be improved, for example being able to see "ghost" notes of the other instruments at the same time, and maybe dedicated left click for creation and right click for deletion! I tried downloading the game several times, yet I still cant play it. could someone tell me how to launch the game for windows 10? do you have basic things, like winrar? 1. are you planning on making this a full game? 2. if so then will there be more choice in instruments? 3. also if so, then how much will it cost? It won't let me download this. Could you make a version you can access on the web? If there already is one, please send me the link! Thank you! can you please explain what you mean here, as "on the web"? ** With the current layout I found it difficult to make the instruments work well together. I ended up doing "I have a drum here and I know I want to wait a couple of half beats and then...wait what was the next drum beat? <switch to drums> Oh ok <switch to harmonica> got that harmonica note, now for banjo do...wait what was the drum? <switch to drum>" You're basically asking the player to be able to imagine the final product but only being able to look at and work with single slices at once. Like if Passpartout The Starving Artist had a separate canvas for each color and you could only view one canvas at a time. 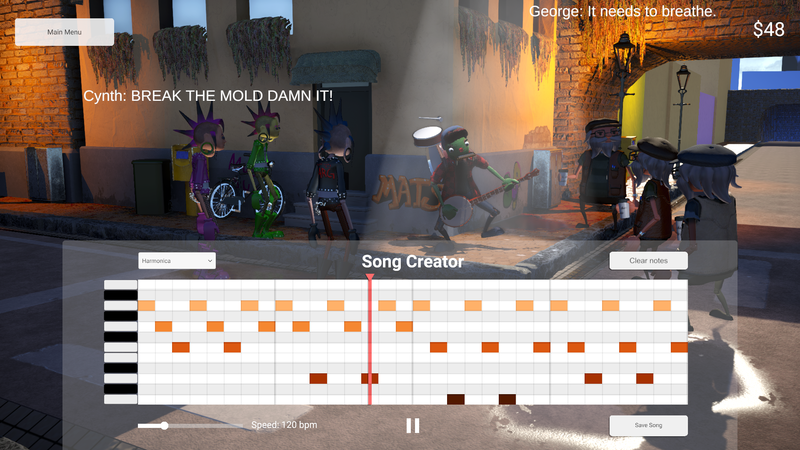 I was thinking you could try treating the UI to work more like a painting instead of different sheets of music per instrument, so basically keep the existing grid, but treat the music score as a single canvas and "paint" an instrument at a specific note and specific time which covers all instruments except percussion, which you could do with a separate translucent layer that comes up when you hold a key or mouse button or something so that the timing matches up but the context of what happens at that time (the horizontal axis) changes, maybe based on what type of instrument (drums, tambourine, etc)? I don't know, just throwing something out there. In any case though, basically making it so I can see everything that's going to happen at a given time. ** Having the notes next to the little piano keys would be helpful in understanding what's going on without having to purely do it by ear -- without that it's akin to trying to paint a picture with the color picker in grayscale. On a side note, I'm a fan of music composition and I would love to be part of a beta test/feedback group if you end up doing this! In any case, good luck! Sorry to hear that. We are aware of these issues and hopefully we will find some time to fix them in the future! maybe you have an older system? May be that it is badly optimized for slower machines? When I saw this I immediately think about playing sans. Hi, I'm a big fan of your games. I am wondering what money would be used for in this game. It seems to have no function yet, but buying/upgrading instruments seems to be a good idea. Love your work, keep it up! Hello guys! Really nice work, event thought it's the first time I play any of your Passpartout games, I enjoyed the background and the characters. I would have loved to have a bit more instruments but had a lot of fun! Have you considered participating in our yearly game developers contest ? It's called the Game Developers World Championship. It's free of charge and could help expend our community of indie developers from all around the world! That's odd :/ It would be great if you could send a screenshot of the error and info about your computer specifications to support@flamebaitgames.com! This game has some real potential. It's a great concept, though maybe not as in intuitive as the first one; it's difficult to make placing notes as fun or intuitive as painting. That being said, I still had a really good time, even though I know nothing about making music (Which clearly shows). Add more instruments, longer tracks, the ability to save, more npcs and progression and this game will be a ton of fun. I like this! 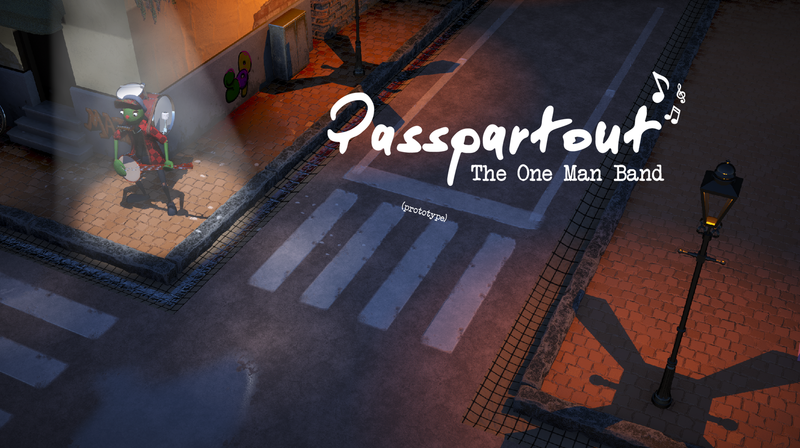 I don't like the fact that you re-used the same people from the other passpartout game, it makes it too simple, will they change?